The second Australasian Conference of Undergraduate Research was held at Macquarie University in Sydney on 19-20 September 2013. This two-day conference included poster presentations and spoken papers by Undergraduate students, Master of Research students (1st year only) and Graduated 2012 Honours students from all disciplines and from across Australasia. What is an undergraduate research conference? An undergraduate research conference is just like any other academic conference but each presentation will be delivered by undergraduate students presenting work they have done either as part of their course or as part of an internship. You will have the opportunity to talk to undergraduate researchers from your own disciplines, and you will also learn a lot about how other disciplines approach research problems. If you are an undergraduate student, this is a great opportunity to meet students from other universities and share your work. The best full papers submitted by undergraduates will be published in a Special Issue of MQ Matrix (Macquarie University's peer reviewed undergraduate research journal). These will also be eligible to win the prize for the best presentation at the conference. 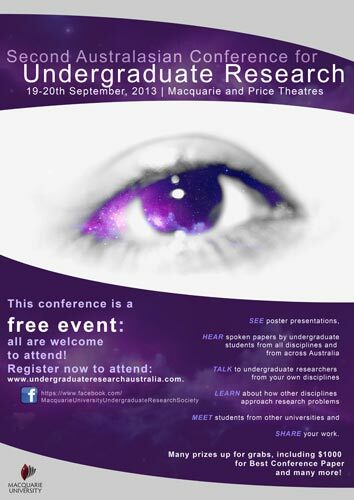 Watch our video invitation to participate in the 2013 Australasian Conference of Undergraduate Research. Note that for the purposes of this conference, "undergraduate" refers to students who have not previously been awarded a degree. It includes Masters students undertaking a first degree at undergraduate level.